Although the entire coast of Portugal faces the Atlantic Ocean it is still regarded as a Mediterranean country, and shares the same climate and ecological characteristics as those surrounded by the Mediterranean Sea. Whilst covering a relatively small area of the globe, the Mediterranean climate region supports a surprisingly large proportion of the planet's plant species - around 20 per cent in total. The plantlife of the Mediterranean regions is almost as diverse and numerous as that of the tropical rainforests, but whereas the destruction of the rain forests is a well-known and much discussed topic, the perilous state of the plants of the Mediterranean Regions of the world is barely known to those outside conservation organisations. Because the mild, wet winters and hot dry summers are as favoured by people as they are by the plants that live there, the pressures on the Mediterranean Regions of the world are extreme, and wildlife conservation is not at the top of the agenda for most visitors to the region. That's not to say that people don't care, after all, a golf course is green isn't it? It's simply that so many of us are so removed from the environment and the plants, birds and animals that share it with us that we have no concept of what makes one patch of ground more beneficial to wildlife than another. Our saving grace is curiosity. So often a chance encounter with a bird or butterfly, or the sight of a 'drive-by wildflower meadow', is all that it takes to trigger an almost insatiable desire to find out what it is that we have seen, and from that comes the inkling of the possibilities of what else might be out there for us to see and enjoy. We hope that this website will help people to see more of the wonderful wildlife of the Algarve and to appreciate and value what lies behind the beaches, villas and golf courses. Not far from the coastal hotspots is a wonder-world of quiet river valleys, wildflower meadows, mountain pastures and forests alive with plants, birds, insects, animals and fungi waiting to be discovered. At the top of this webpage there are links to the five most significant types of habitat to be found in the Algarve: Coastal, Garrigue, Maquis, Wetlands, Woodlands and Mountains, and what you can expect to see if you take a stroll through any of them. There are also separate pages for each of the four major Natural Parks and Reserves in the Algarve Region, and the myriad plants, insects, birds and animals that live there. Additional pages detail other sites and places which are good for wildlife walks, and a separate section showcases some of the most beautiful and interesting Algarve wildlife species. 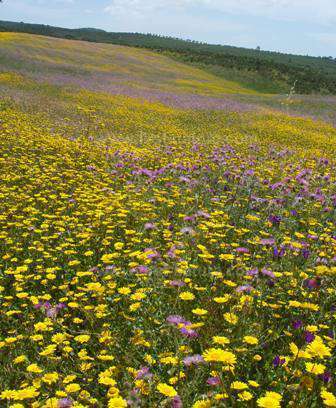 The best time to see wildflowers is spring which comes much earlier in the Algarve than it does further north. The first flowers appear in December and January when the ground is suddenly lit up by carpets of Bermuda Buttercups. Although the sight of this bright yellow flower are welcome to visitors from the UK and northern Europe, it is an absolute curse for the Algarve farmers who have to clear it in order to plant their early crops. March is the beginning of the wild orchid season and the first to appear are the Mirror Orchid (Ophrys speculum), the Bumblebee Orchid (Ophrys bombyliflora) and the Yellow Bee Orchid (Ophrys lutea). They are quickly followed by many more orchid species, and the stunning displays of the countless beautiful wildflowers to occur in this part of Portugal. 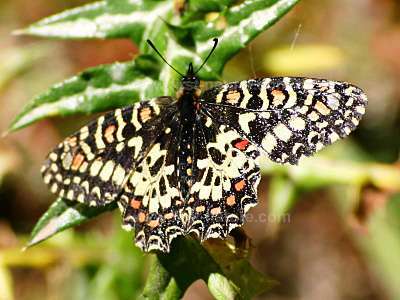 The peak of the wildflower season is also the best time to see the brightly coloured butterflies and moths that patrol the flower habitats in seach of nectar, and the Algarve is also home to many more fascinating insects although they may not be as obvious to the casual visitor as some of the lovely butterflies. By the beginning of May the ground is starting to look parched and the wildflowers, with the exception of a few hardy individuals such as the Spanish Oyster Plant (Scolymus hispanicus), and one or two late-flowering species which include Sea Daffodil (Pancratium maritimum), are nearly over for the year. Up in the mountains where it is a bit cooler the flowers last until the middle of June. The Algarve region is home to many interesting trees and shrubs although the most noticeable one to those visiting from April onwards will be Cistus - the bushes clothe the roadside banks, particularly in the hills. The most common species is Gum Cistus (Cistus ladanifer) which has brilliant white flowers with red splotches at their centres, but the Algarve is home to several other species of cistus, too. Another special tree is the Strawberry Tree (Arbutus unedo) which bears it's strawberry-like fruit which ripens at the same time as the following year's flowers open. The appearance of the fruit is all that it has in common with strawberries and it is not at all good to eat. The Portuguese make a strong spirit drink from the fruit which is called Medrhono and it is one of their favourite tipples. Later in the year, the Algarve is an excellent place to see numerous species of fungi, both in the woods and in the meadows and fields. 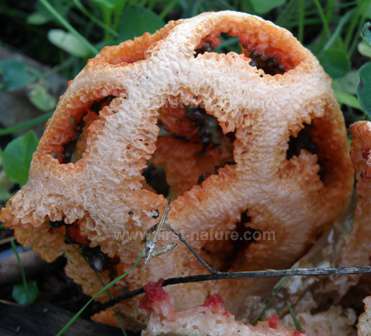 Species that are rare further north in Europe are relatively easy to find in parts of the Algarve and these include various coral fungus species and also Red Cage Fungus (Clathrus ruber). The area is also exceptionally good for boletes and bracket fungi. The Algarve is a world-renowned destination for bird watchers. Many of the birds seen in the Algarve are residents, but in spring and autumn the Algarve is one of the best places to observe passage migrants as they head to their breeding grounds in Northern Europe in spring , and then back again to the wintering territories of Africa and Asia in the autumn. The most likely time to see the migrants at close quarters is if they encounter extreme weather conditions which force them to land and wait until the weather improves suffienciently for them to continue with their journeys. Since particular species tend to travel together, bad weather can mean that many thousands of birds of single species can be seen in during these periods.